You may schedule your own session & make your payment using the calendar below. (In Person Session availability included on calendar) If you have already scheduled your appointment time(s) via email, please use the payment options at the bottom of this page to confirm your appointment. All Sessions and Arts Practices are available in person or via SKYPE. Single session: $250 for 90 minutes. $5 Per Minute Session: You choose your time, very often profound changes can occur within 15 to 30 minutes. This approach to pain management, therapy, and healing is different because we address pain at its roots… which are energetic. “We have the same goal… to help you feel better. We go there together”. We breathe every moment with very little awareness. The breath is literally our lifeline to existence. When the breath is arrested, life as we know it, on the gross, material plain, comes to an end. When we increase our awareness around our breath we increase our connection to life, universal energy flow and G-d head intelligence. The basic practice of working with the breath is rumored to be over 40,000 years old. There are thousands of sequences involving different holding patterns, separated by timed inhalations and exhalations. Each and every method opens portholes to varying levels of non-ordinary consciousness, mental and physical faculties. Most familiar in the West perhaps are the Yogic Pranayams, which aid the physical, mental and subtle body for preventative disease control and or to prepare for meditation and Stanislav Grof’s Holotropic Breath Work, Leonard Orr’s Rebirthing, Vivation developed by Jim Leonard and many more variations of Yoga rebranded and labeled as discoveries made and developed by Western Practitioners . 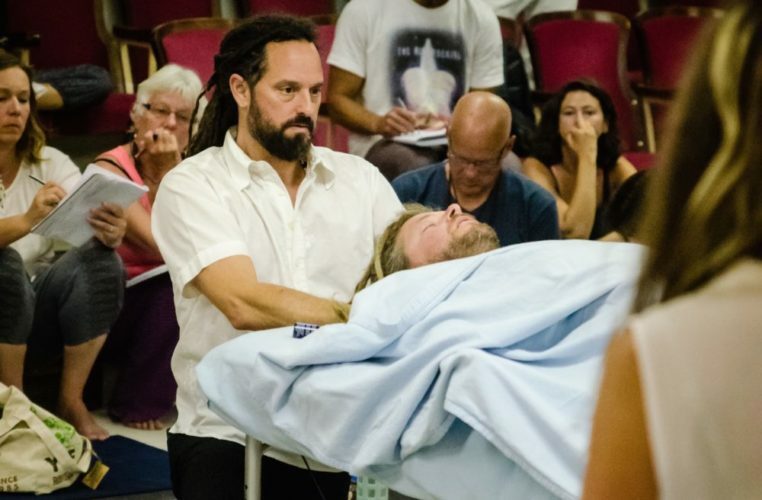 The Breathwork you will experience here is not widely known of or taught in Yoga, Shamanism or as a portion of basic Spiritual Curriculum, but it should be. Gentle Pranayam methods do not promote hyperventilation or re-traumatization. The breath is a two-part exercise using only the mouth. There are two inhales. The first inhale is into the lower belly. The second inhale transfers the first from the belly into the upper chest which then is exhaled in full release. This practice is very powerful and need not be forced or practiced with any level of strain. Develop a 7-minute breath practice twice daily using the above listed exercise and watch your connection to creativity, wellness and spirit blossom. Note! There are sequences in the exploration of Breathwork that require 15 to 30 minutes or longer of grounding and “getting back into” the body after the practice has been competed. Humans are by and large ungrounded, functioning much of the time in their heads with little awareness and true connection to the body. It is recommended that a regular Yoga practice or other vigorous exercise plan is paired with a plant-based diet and added to your Breathwork practice. This way, the experience of journey into extra ordinary levels of consciousness will truly be embodied and bring about the full benefit of an integrated, healthy spiritual life experience. Fill Out Request Form Today!